A living trust is a written legal document through which your assets are placed into a trust for your benefit during your lifetime and then transferred to designated beneficiaries at your death by your chosen representative, or trustee. 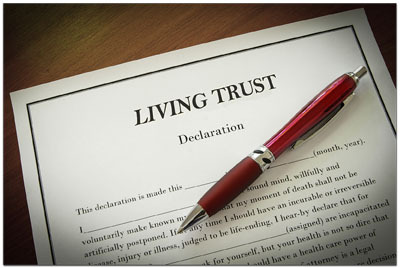 One of the first benefits of a living trust is that it avoids probate. A living trust does not go through probate, which often means a faster distribution of assets to your heirs—from months or years with a will down to weeks with a living trust. Drafting a living trust will likely cost more than drafting a will as it is a more complex legal document. You must also transfer your assets such as bank accounts, stocks, and bond accounts and certificates to the trust through separate paperwork. There is the level of privacy offered with a living trust. As a living trust is not made public, upon your death, your estate will be distributed in private. A will, is public record and so all transactions will be public as well. Living trusts is written so that your trustee can automatically jump in quickly, especially if you become ill or incapacitated. Living trusts will help avoid probate, in the handling of out-of-state property you own. With a will, property will have to go through probate in its own state. Living trusts can save your estate money. At the time of your death, the distribution of assets in the trust will not go to probate. Living trusts hold up better, especially if someone steps forward to contest the distribution of your assets. Living trusts can provide savings for married couples in the form of joint living trusts. The larger the value of the estate, the greater need there is for a living trust. Most tax professionals and planners tend to agree with this rule.